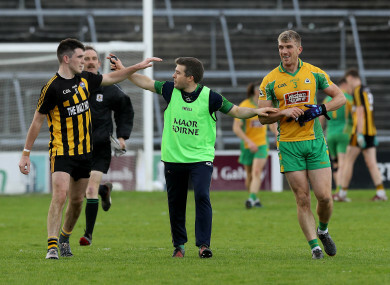 Kieran Fitzgerald’s winning run with Corofin shows no sign of abating. Kieran Fitzgerald and Barry McHugh were sent-off in Sunday's final in Galway. A YEAR AGO Kieran Fitzgerald overtook clubmate Trevor Burke as the record Galway championship winner, but after winning his 13th county medal at the weekend he thinks this was one of the sweetest of them all, despite being sent off for the first time in his lengthy career. “We were probably written off a bit before that Annaghdown semi-final and then in the drawn final we didn’t perform at all. We were very grateful to get another opportunity but it wasn’t a great performance at all. After Sunday’s county final 1-8 to 0-5 victory, Corofin manager Kevin O’Brien proclaimed that Fitzgerald is still one of the best full-backs in Galway. He was tasked with marking current inter-county star Barry McHugh and he kept him scoreless from open play. “Ideally I suppose we would have liked to play a bit more. We did the best we could but it was a terrible game. It wasn’t the way we wanted to play but it was put in front of us and that’s what we have to do. We dealt with it well and we learned a lot. “I don’t think we’ll see that anymore. I think a lot of teams just want to play football. I don’t think we see it again to be honest and if we do football is in a bad spot. Email “A first red card in Galway All-Ireland winner's career as he picks up 13th county senior medal”. Feedback on “A first red card in Galway All-Ireland winner's career as he picks up 13th county senior medal”.